The KCA Kandy Kable is made from Copper Clad Aluminum (CCA) and wrapped in an limited edition ultra flex neon green PVC. Copper Clad Aluminum (CCA) is made up of 90% Aluminum and 10% Copper. CCA overall provides a cost effective solution to most audio systems. Assembled from stranded 34 gauge CCA, the KCA Kable is equal in size to the Kolossus Flex Kable, but is designed for lighter current loads and not lightening your wallet. The Neon Green Kandy Kable is a limited edition PVC outer jacket that is impervious to grease and oil. The ultra flexible PVC outer jacket can with-stand the extreme temperatures (-40 to 105 C) and capable loads of 250A. Price is per one foot. 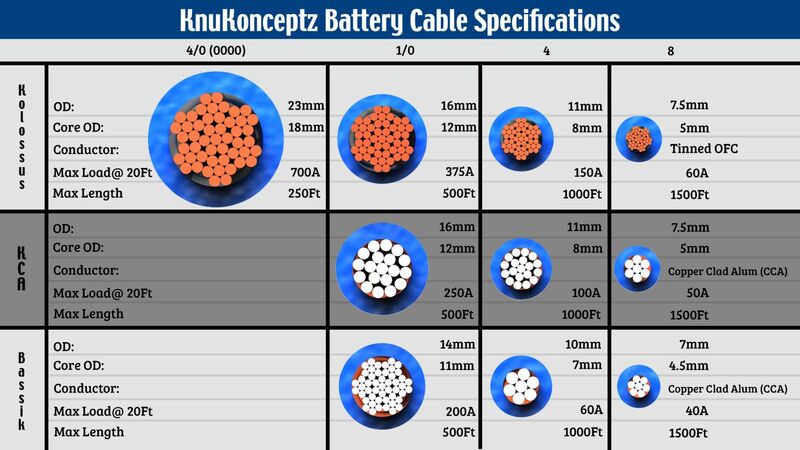 Overview –KCA Kable Power / Ground Wire consists of over sized, 34 gauge stranded, copper clad aluminum (CCA)conductors. Because we are using CCA, the KCA Kable has been over sized to offset the higher resistance of the CCA compared to that of an OFC cable. Following the load chart above, the use of the KCA Kable follows accepted indusry standards for voltage drop over the rated distance. Applications include mobile audio and other 12V automotive applications. The KCA Kable features an ultra flex matte PVC jacket that makes it bend to any radius and stable in temperatures from -40C to 105C. Neon colors include: Blue, Green, Pink, Purple, Orange, and Yellow. Some colors are UV reactive and will glow under black light. Notes –While our KCA Kable is over sized, most manufacture’s terminals will still fit our cables.